When I was ‘challenged’ by my Coach to write my story, I was hesitant, wondering who on earth would want to read a book about death and dying and survivorship. After a few promptings, I got my second book published and I have been able to see how the readers are Blessed by my sharing my story. “He Hit The Clouds Running …… and never looked back” has provided a platform, for those of us who have experienced the death of a loved one, to verbalize our feelings. Most people are uncomfortable watching other people struggle with ‘issues’ and grief, bereavement, is certainly a powerful force. 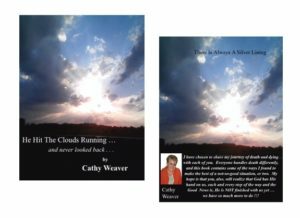 If you think you would be Blessed by my book, please reach out to me at www.CathyWeaverKC.com and I will send you a copy. My motto is, we are all in this together so let’s learn from each other how to make it through.